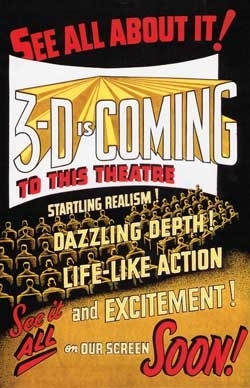 "A fascinating history of 3-D and wide-screen film-making." "Long settled as leading authority on depth and widescreen history." Welcome to the 3-D Film Archive; the first organization dedicated to saving and preserving our stereoscopic film heritage. Founded in 1990 by award-winning producer, author and motion picture archivist Bob Furmanek, we have located and restored original dual-strip 35mm polarized 3-D prints of more than thirty features and two dozen shorts from 1922-1955, the “Golden Age” of 3-D cinema.